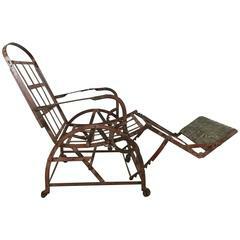 Antique adjustable folding Campaign style invalid chair or deck chair by the Marks Adjustable Chair Co. 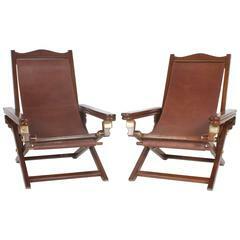 This circa late 19th Century chair is in fabulous antique condition and ready to use. This amazing antique chair can assume more than fifty individual positions!! Plus; it rocks, literally!!! The concept for this fantastic chair was derived from late 18th century portable metal campaign furniture used by military officers in the field. In answer to popular demand for elaborate folding chairs in the late 19th century, Cavedra b. Sheldon, a New York City architect and inventor, designed this chair and sold the design to the marks adjustable folding chair company of New York City, which manufactured it for almost 25 years from 1876 to 1895. 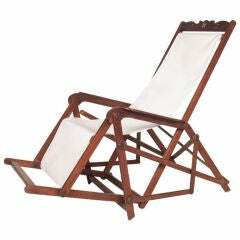 In addition to being used in homes as a parlor chair, library chair, and smoking chair, as promoted by the manufacturer, it was widely used as an invalid chair in Sanitariums and Sanitoriums, and as a deck chair in resorts and on ships. The chair we are offering is in extremely good condition and was upholstered recently in a blue traditional fabric. It retains its original brass marks company tag, you can still see the decorative paint detail on the iron frame, the original cane is intact, and all the mechanisms are working well. With our photos, we have tried to display just a few of the comfy positions possible with this unique and wonderful chair, and don’t forget it rocks, which is held in the permanent collections of both the met (metropolitan museum of art) and the Brooklyn museum. 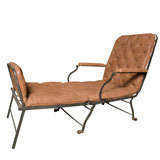 I know you will enjoy this incredible and comfortable work of functional art. You must make it yours. 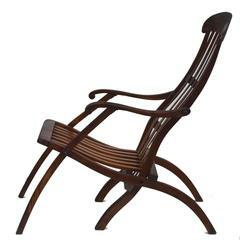 Chair size: height upright– 40 inches Height opened fully– 18 inches Footrest height– 22 inches Width– 30 inches Depth as chair– 33 inches Length fully extended– 72 inches Seat depth as chair– 22.5 inches Seat depth as lounge– 44 inches Seat height as chair– 20 inches Seat height as lounge - 17 inches Arm height– 26 inches Weight– 74 pounds Crated size: height– 46 inches Width– 35.25 inches Depth– 30.75 inches Weight– 204 pounds. This chair is in wonderful vintage condition. You can still see the detail painting, the cane is intact and all the mechanisms work well. 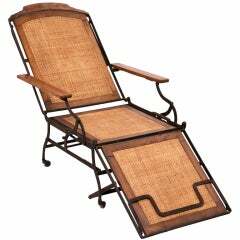 Ficks Reed Rattan Lounge Club Chair by John Wisner Campaign Style Far East Coll. 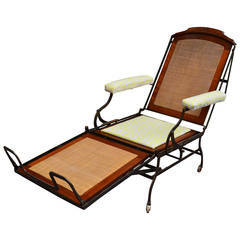 French wrought iron adjustable folding chaise lounge, 19th C.